Cute as the newest baby boy in your life, this sweet dinosaur-themed starter set is ready to welcome the latest bundle of joy. Organic and cozy, it's perfect for any mom bringing home her cherished little one. Whether for a coming home gift for a baby shower, hospital visit, or any other special moment, spoil them as they come home! One hand crafted wood crate 11"x6"x6" with cord handles and chalkboard on both sides for personalization. Its multi-purpose use allows mommy to store her precious littles everyday essentials. 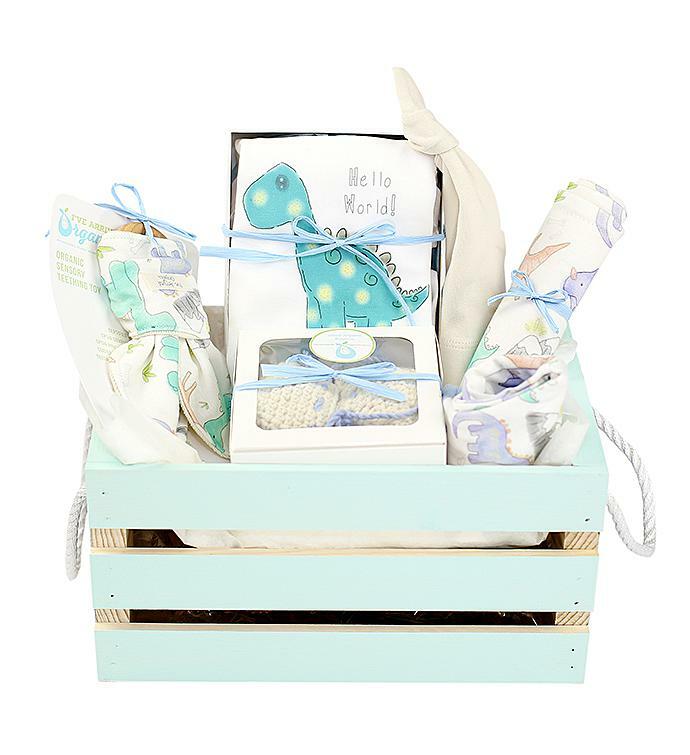 Cute as the newest baby boy in your life, this sweet dinosaur-themed starter set is ready to welcome the latest bundle of joy. Organic and cozy, it's perfect for any mom bringing home a her cherished little one.